Dodson & Horrell Cushcare Condition - 18kg. 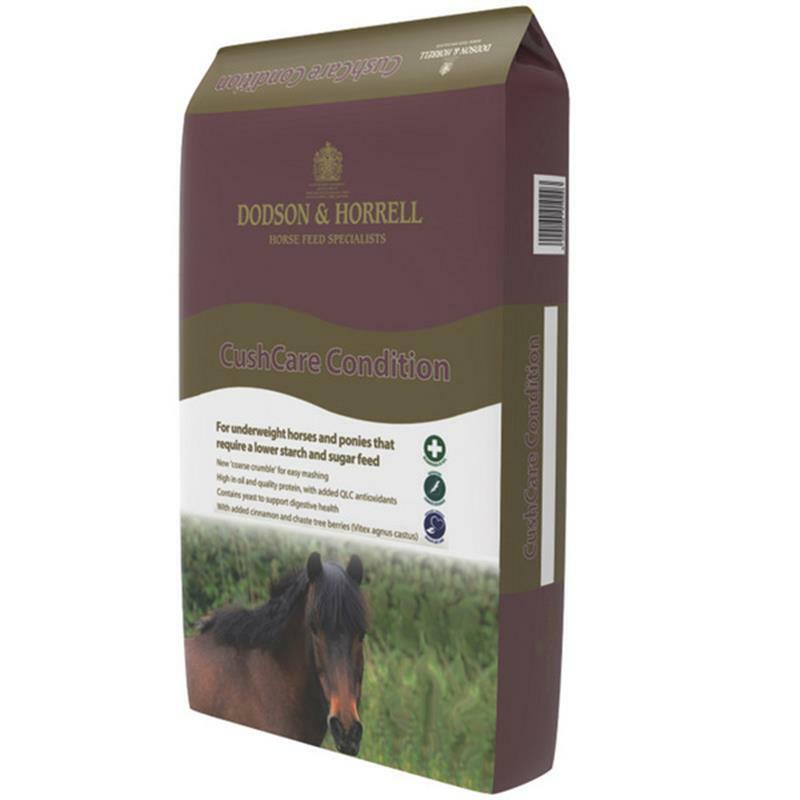 Cushcare Condition is a complementary feed for underweight horses and ponies that require a lower starch and sugar feed. New 'coarse crumble' for easy mashing. High in oil and quality protein, with added QLC antioxidants. Contains yeast to support digestive health. With added cinnamon and chaste tree berries. Essential amino acids which are the necessary building blocks for protein and are therefore important in the nutritional support of muscle cell maintenance and generation. High in oil to provide calories without adding starch to support a healthy coat. Contains soya lecithin to support weight maintenance, fat digestion and absorption. Added B vitamins and carnitine also help the metabolism of fat. The patented QLC package of antioxidants (including vitamin E, vitamin C and selenium) supports the horse's immune system and 'mops up' excess free radicals that may be associated with ageing. Contains live Actisaf yeast and prebiotics to promote a healthy digestive system and the normal function of the hindgut. Omega 3 fatty acids, glucosamine and the mobility herbs package nutritionally support joint function. Cinnamon for nutritional support of insulin metabolism. Chaste tree berries (Vitex Agnus Castus), which many horse owners believe may be beneficial in support of older horses. Digestible fibre provides natural calories and promotes healthy hindgut function.